Stunning model of the Sirius, featured in Tintin books. The Sirius is a fictional vessel first appearing in the Tintin graphic novel The Shooting Star, and later in The Secret of the Unicorn and Red Rackham’s Treasure. It was named after the SS Sirius, the first steam-powered ship to cross the Atlantic under its own power. 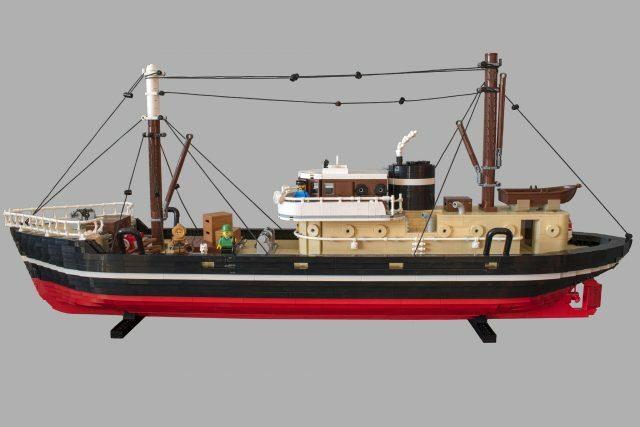 This wonderfully detailed boat by Stefan Johansson is so accurate compared to images of the vessel John-O.88, a trawler that inspired the author, that it is easy to mistake it for a wooden model. The curved hull is particularly impressive, along with the riggings, made up of various lengths of LEGO string elements. On deck, Tintin is ready to plunge into the depths in his diving suit, while Snowy, Thomson (or Thompson?) and Captain Haddock look on. Actually, now that I think about it, that’s Professor Calculus in the green hat. Thompson and Thomson were usually in black.